Large adult dogs have a relatively small digestive apparatus and thus limited digestive capacity. This must be compensated by highly digestible food. Taurine may help to strengthen the heart function and heart muscles. Chondroitin sulfate and glucosamine together with EPA & DHA (0.4%), the cartilage and joint health. Carefully selected nutrients, modern technology and natural flavors provide even with fussy appetites for maximum acceptance. Fully grown large dog can weigh up to 44 kg. Due to their specific characteristics, they not only have a sensitive digestion, but also sensitive joints. Why have especially large dogs tender joints? Due to their natural size and high body weight (up to 44 kg) are the joints extreme loads ausgesetzt.Durch excessive exercise, especially in young dogs, can cause damage at an early stage of bone and joints, such as Arthrosis (Fig. 1). EPA and DHA can contribute to an optimum digestion safety. Beet pulp can improve stool consistency. With the food, the dog takes nutrients in a first non-usable form for him. Through various mechanisms and enzymes (fission products) in different sections of the gastrointestinal tract proteins, fats and carbohydrates are broken, to this record from the intestine with the target. Nutrients such as minerals and water are mainly absorbed in the small intestine. 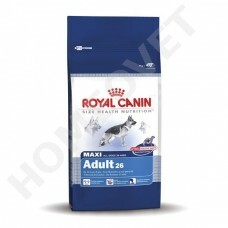 In the large intestine of the dog is a bacterial flora that takes numerous functions. It forms e.g. certain vitamins for dogs and their digestion of fibrous materials produced metabolites that serve the health of the intestinal cells. Overall, this is when the digestive processes is a complex mechanism that may be sensitive to disturbances. Why have particularly large dog a sensitive digestion? * Anatomical reasons: The relative weight of the gastrointestinal tract in relation to their body weight makes for big dogs only 2.7% from 7.0% in small dogs, however (Fig. 2). * Dogs have a higher Kotwassergehalt (Fig. 3) in comparison to their body weight. 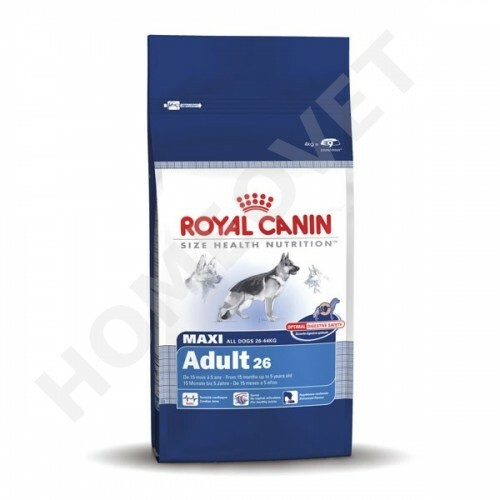 * Increased permeability of the intestinal walls, which has an increased entry of water into the intestine result. * Increased fermentation activities of colonic bacteria, with the result of bloating. The aim of the diet should inter alia be to take into account the peculiarities of the digestive big dogs. * Highly digestible proteins best quality (chicken, egg, fish). * Beet pulp as only moderately fermentable fiber to avoid excessive fermentation processes. * Insoluble clay minerals and non-fermentable fibers with high water binding capacity minimize the moisture content of the faeces. Composition of maize, dehydrated poultry meat, maize flour, animal fats, greaves, corn gluten feed, animal protein (hydrolysed), beet pulp, minerals, fish oil, soya oil, yeast, egg powder, hydrolysed crustaceans (rich in glucosamine), taurine, hydrolysed cartilage (source of chondroitin ). Protein (%) 26 Building materials of the body, formation of connective tissue, muscles, etc.